In this video we will discuss the differences between promises and observables. In Angular 2, to work with asynchronous data we can use either Promises or Observables. In our previous videos in this series, we discussed using both Observables and Promises. There are several differences between Promises and Observables. In this video let's discuss these differences. Observable provides operators like map, forEach, filter, reduce, retry, retryWhen etc. A Promise emits a single value where as an Observable emits multiple values over a period of time. You can think of an Observable like a stream which emits multiple items over a period of time and the same callback function is called for each item emitted. So with an Observable we can use the same API to handle asynchronous data whether that data is emitted as a single value or multiple values over a period of time. A Promise is not lazy where as an Observable is Lazy. Let's prove this with an example. Consider this method getEmployeeByCode() in employee.service.ts. Notice this method returns an Observable. Here is the consumer code of the above service. In our example, this code is in employee.component.ts in ngOnInit() method. Notice we are subscribing to the Observable using the subscribe() method. An Observable is lazy because, it is not called and hence will not return any data until we subscribe using the subscribe() method. At the moment we are using the subscribe() method. So the service method should be called and we should receive data. 1. Launch Browser developer tools by pressing F12 while you are on the browser. 4. In the Filter textbox, type "api/employees"
Instead of hovering over the request, if you click on it, you can see the response data as shown below. Make sure you select the "preview" tab. Now in employee.component.ts file, comment the subscribe() method code block as shown below. Notice we are still calling the getEmployeeByCode() method of the EmployeeService. Since we have not subscribed to the Observable, a call to the EmployeeService will not be issued over the network. With the above change in place, reload the web page. Notice no request is issued over the network to the EmployeeService. You can confirm this by looking at the network tab in the browser developer tools. So this proves that an Observable is lazy and won't be called unless we subscribe using the subscribe() method. Now, let's prove that a Promise is NOT Lazy. I have modified the code in employee.service.ts to return a Promise instead of an Observable. The modified code is shown below. Here is the consumer code of the above service. In our example, this code is in employee.component.ts in ngOnInit() method. 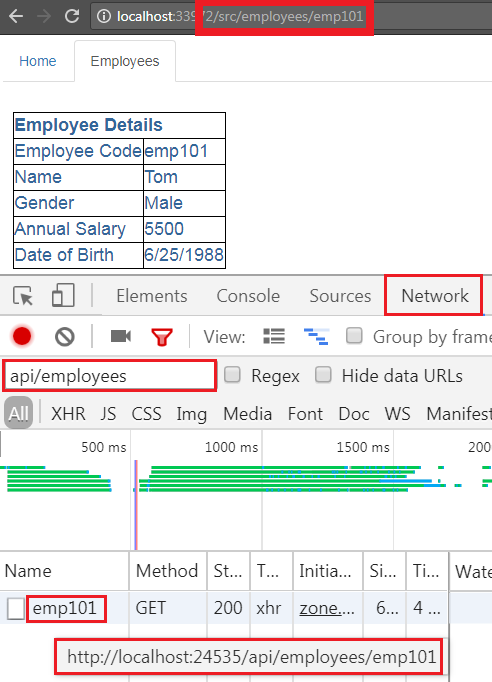 Because a promise is eager(not lazy), calling employeeService.getEmployeeByCode(empCode) will immediately fire off a request across the network to the EmployeeService. We can confirm this by looking at the network tab in the browser tools. Now you may be thinking, then() method in this case is similar to subscribe() method. If we comment then() method code block, will the service still be called. The answer is YES. 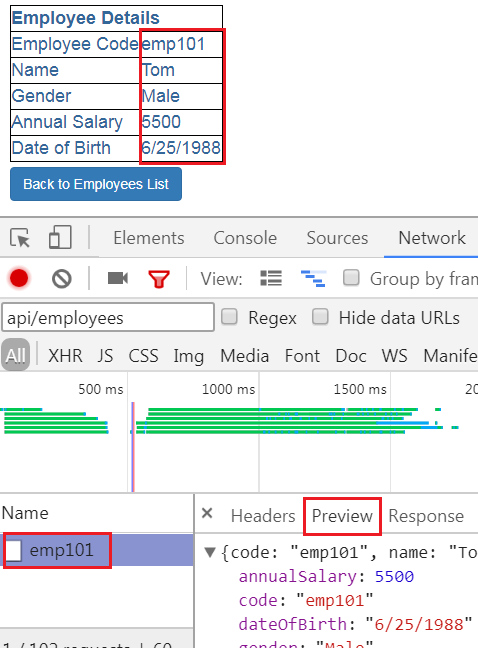 Since a Promise is NOT LAZY, Irrespective of whether you have then() method or not, calling employeeService.getEmployeeByCode(empCode) will immediately fire off a request across the network to the EmployeeService. You can prove this by commenting then() method code block and reissuing the request. In our next video, we will discuss how to retry when a request fails and in the video after that we will discuss how cancel an Observable.